For only the third time since 2000 Kerry won't be in the All-Ireland semi-finals after failing to get out of the All-Ireland Quarter-final group despite beating Kildare by 12 points in Killarney. That was only half the task facing the Kingdom, but the other part was out of their control in Salthill, and with Monaghan beating Galway up there it sealed Kerry's fate, which is an earlier than usual exit from the Championship. Kerry knew their Championship survival would be determined at Pearse Stadium as much as in Killarney and so it came to pass despite their big win over a Kildare team that finished with 12 men on the field at the end, after a couple of red cards and a black card. What Kerry take from this performance into a long winter of introspection is for another day but it was a scratchy performance from Kerry, at least until Kildare were reduced to 14 men just before the interval. Thereafter Kerry made hay in the open spaces but they will take little, if any, consolation from what has been a very poor Super 8 campaign. All of the drama was reserved for the last 10 minutes of the first half when Kildare momentarily opened up a six-point lead but then had goal scorer Neil Flynn sent off on a red card with full back David Hyland following soon after for a black card foul. Kerry made their numerical advantage tell in the second half, and they got the perfect start when Clifford capitalised on a Donnellan mistake to roll his second goal into an empty net, and Geaney soon had the scores level, 2-9 to 1-12. 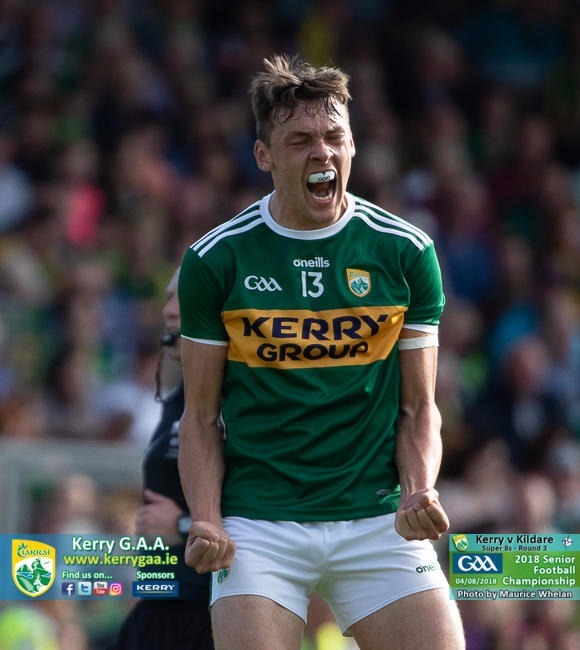 Thereafter it was all Kerry as they finally found their rhythm, with O'Donoghue's goal in the 45th minute easing fears that Kerry might win, but not by enough. They needn't have worried on that score as they piled on the scores against a Kildare team that had Mick O'Grady red carded late on, but it's Monaghan and Galway who advance from Group One, leaving Kerry and Kildare to reflect on their respective campaigns. KERRY: Brian Kelly; Jason Foley, Peter Crowley, Tom O'Sullivan; Paul Murphy, Killian Young, Gavin White; David Moran, Jack Barry; Micheál Burns, Sean O'Shea, Stephen O'Brien; David Clifford, Kieran Donaghy, Paul Geaney. Subs: Kevin McCarthy for K Young (HT), James O'Donoghue for K Donaghy (HT), Darran O'Sullivan for M Burns (57), Tadhg Morley for J Foley (59), Anthony Maher for S O'Shea (67), Brian Ó Beaglaíoch for G White (inj, 69). KILDARE: Mark Donnellan; Peter Kelly, David Hyland, Mick O'Grady; Johnny Byrne, Eoin Doyle, Kevin Flynn; Kevin Feely, Tommy Moolick; Fergal Conway, Paul Cribbin, Keith Cribbin; Neil Flynn, Niall Kelly, Paddy Brophy. Subs: Chris Healy for K Cribbin (27), James Murray for D Hyland (b/c, HT), Cathal McNally for M O'Grady (47), Eamonn Callaghan for F Conway (51), Fionn Dowling for T Moolick (56), Mark Hyland for P Kelly (62).